Welcome to our patented Horti Hood 90 folding greenhouse. On warmer days, just lift up the HortiHood and catch a bit of rain. 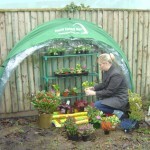 With the HortiHood canopy down warmer temperatures really bring on and protect young plants and seedlings. Pushing the boundaries of design the curvaceous Horti Hood 90º fold-up greenhouse is perfect for the ‘Grow Your Own’ fan. 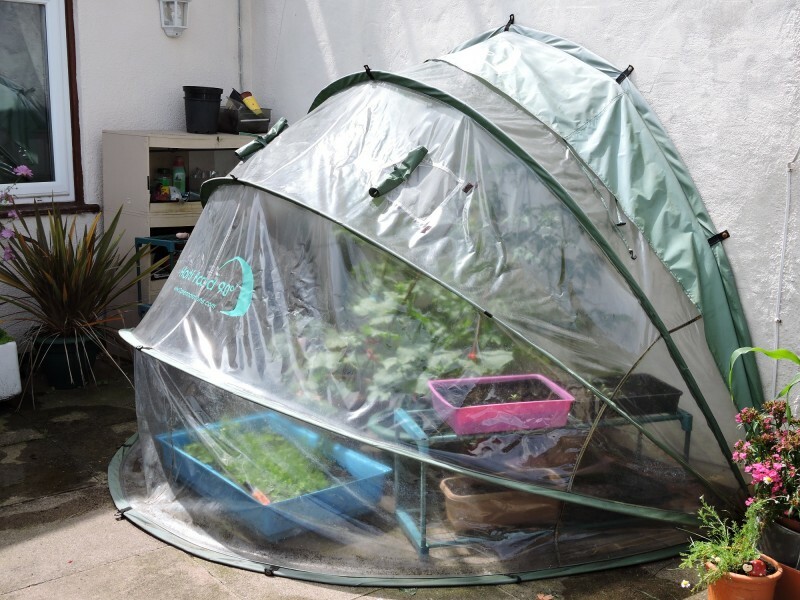 This innovative, wall-mounted greenhouse is a great way to germinate your seeds, grow on your plants and then extend the growing season… all in one place. 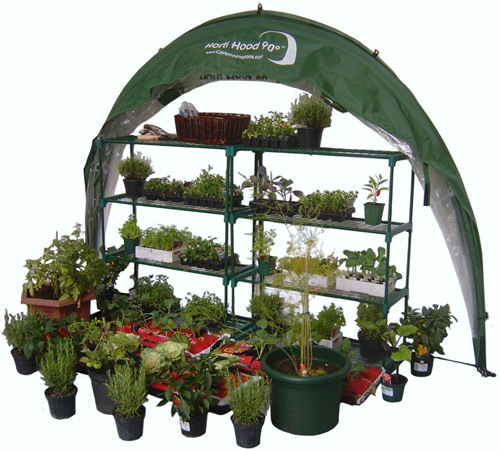 With your HortiHood you can grow a wider variety of plants. 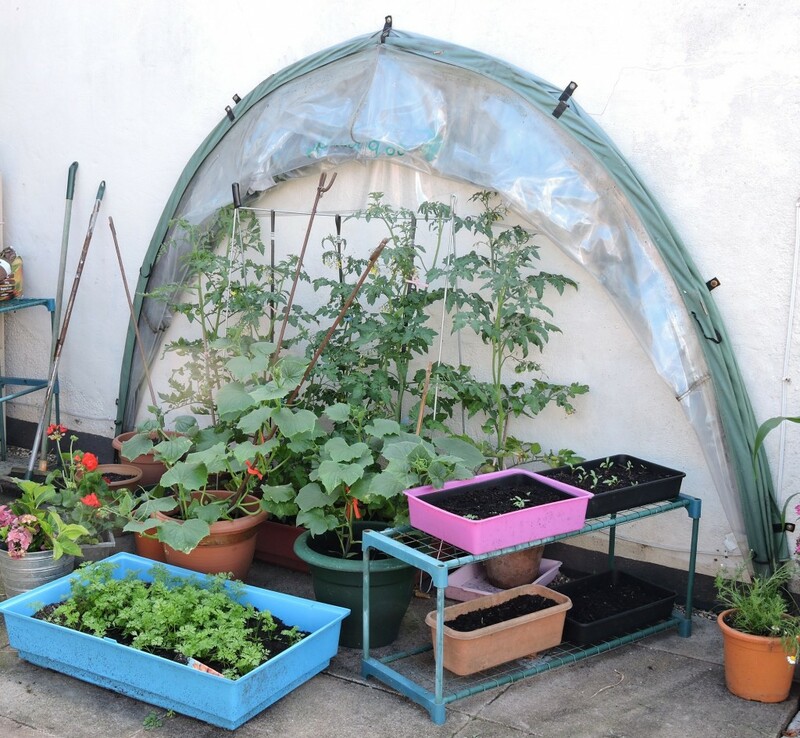 The HortiHood 90 wall-mounted folding greenhouse (top, left) ready to drop down if night time temperatures are forecast as low. 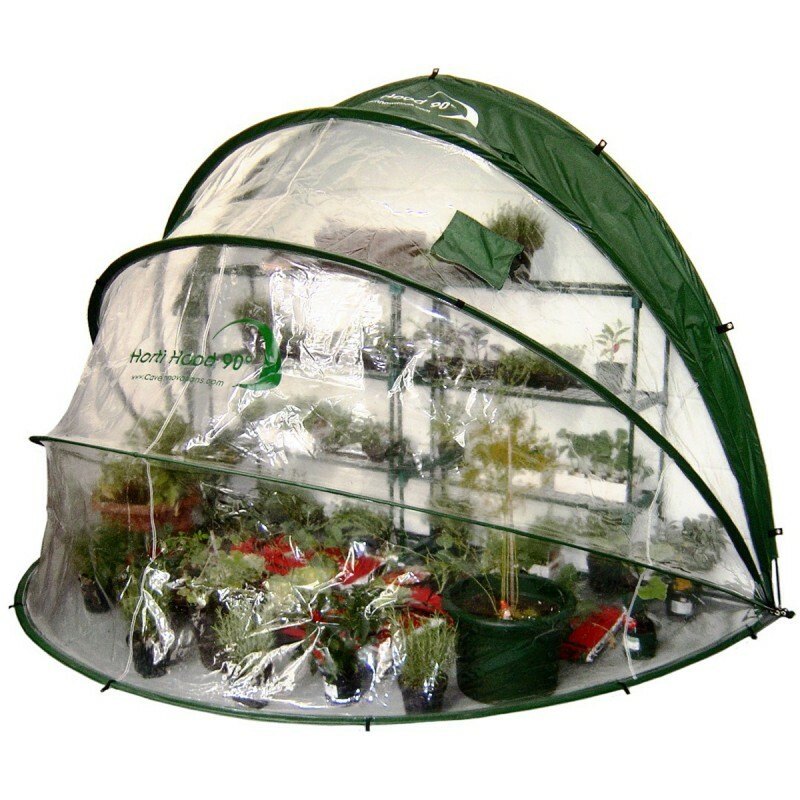 The wall mounted Horti Hood 90° folding greenhouse is extremely spacious at: 250 cm wide x 167 cm deep x 167 cm high. 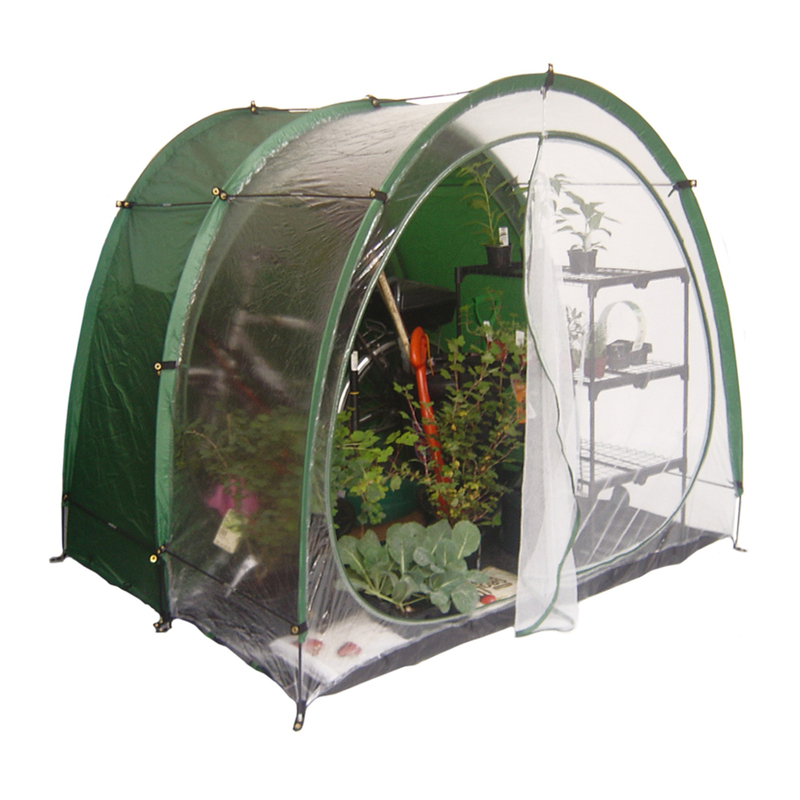 Packaged, the HortiHood 90 is just 51 cm long x 30 cm wide x 8 cm high and weighs just over 4 kg. Two mesh covered ventilation panels allow your plants to breathe while keeping out the pesky critters. You can close them if you want to increase the temperature and humidity. For greater ventilation you can hook the front up in any of four different height settings. 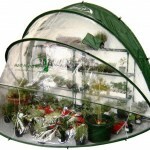 You will be amazed at the things you can grow in a Hortihood 90º. There’s plenty of room for taller plants at the back and lower ones nearer the front. Alternately greenhouse staging against the wall/fence will vastly increase how much you can get inside. 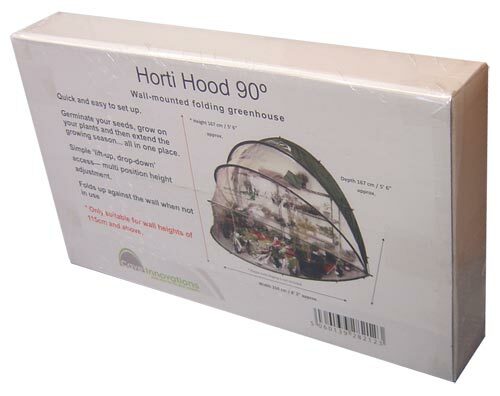 Grow-bags, pots and troughs will all be at home in your Horti Hood 90°. 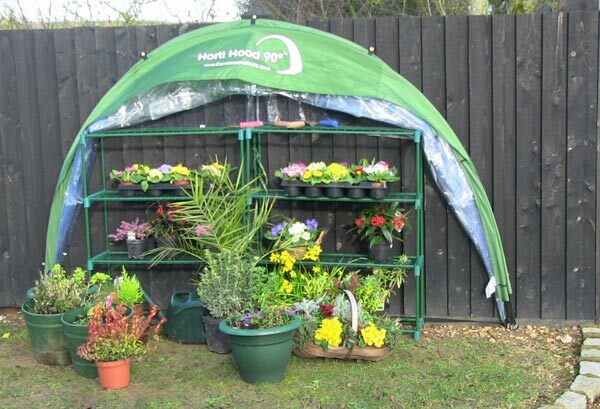 Using the Horti Hood fold-up PVC greenhouse allows you to extend the growing season, starting earlier and growing for longer, later into the year. 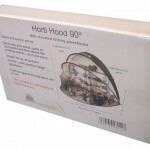 HortiHood 90 will protect your plants during the Winter. In our experiments we have found that the air temperature under the Horti Hood 90 when measured in the morning after a sharp overnight frost is 8 degrees Celsius warmer. That can easily be the difference between plants dying or surviving. Access couldn’t be easier or quicker. 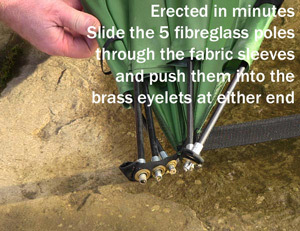 Simply lift up the front and hold it in place with the hook or loops & toggles. 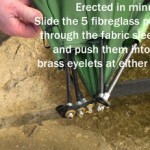 For more serious pottering you can slide the frame under the integral rain awning. 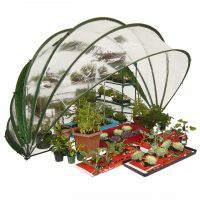 This not only holds it securely out of the way, it also prevents rain from gathering in the folds and saves you from a potential soaking when you close the greenhouse after heavy rain. An additonal, double hooked, central strap provides extra support and helps reinforce the HortiHood in the event of snow. 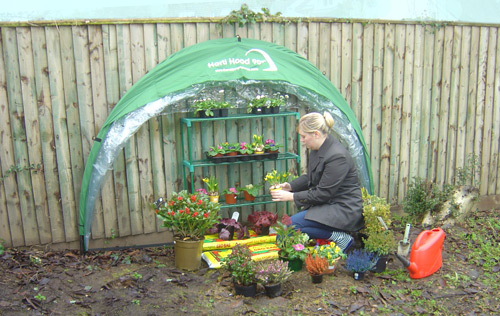 Your Hortihood 90° folding PVC greenhouse can be fixed to a wall or fence with the screws and plugs included in the pack. 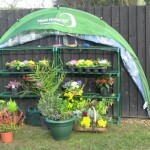 You can use one on your allotment, fixed to the side of your shed. 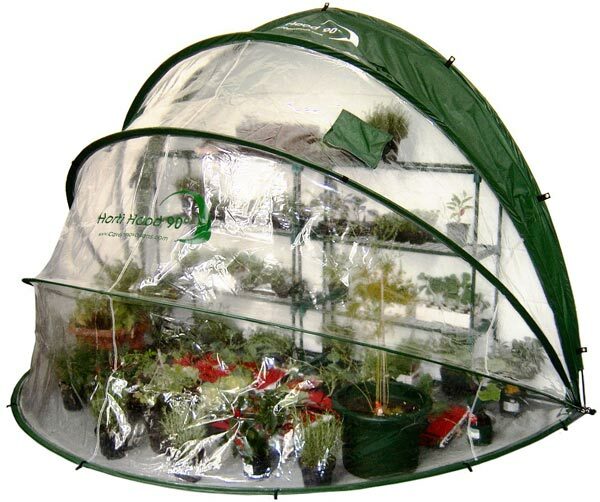 Hortihood 90º is large enough for you to add greenhouse staging, allowing you to grow even more! 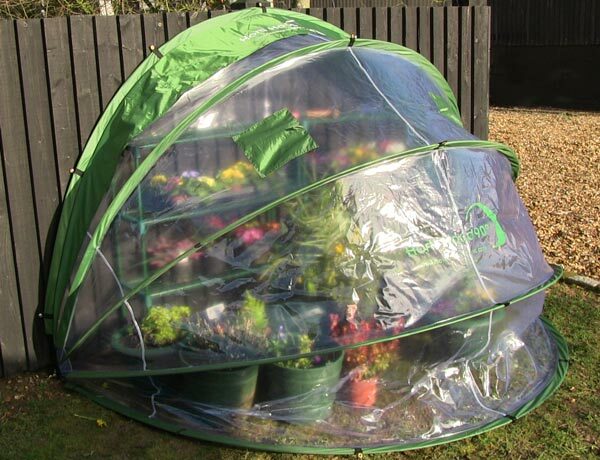 When the weather gets cooler pop your vulnerable plants inside to help protect them during the winter. 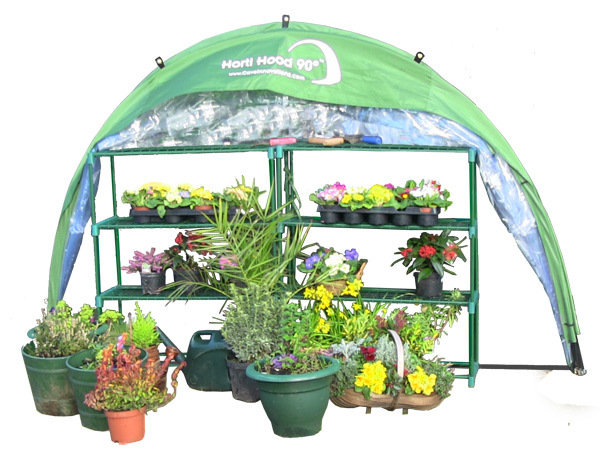 A major benefit of the Horti Hood 90º PVC wall-mounted folding greenhouse is its ease of use and convenience. If you don’t need it you can take it down, leave it folded up against the wall or take it down and put it away until next year. 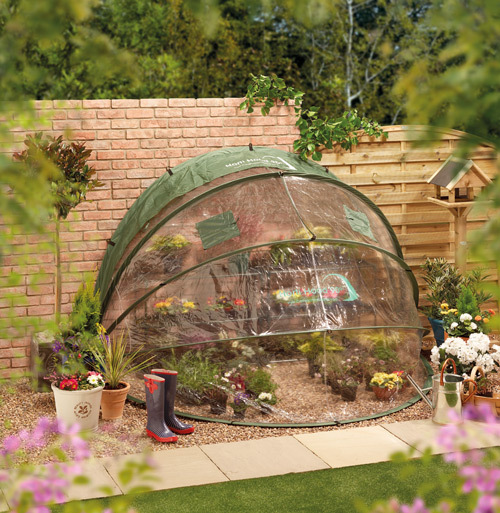 A key feature of the HortiHood 90 fold up greenhouse is the rear “windblock panel”. While the maximum height at the apex of the Horti Hood is 167cm, this panel means you can fix your Horti Hood 90 folding greenhouse against walls or fences as low as 115 cm. In addition to the five brass fixing eyelets across the lower edge of the “windblock panel”, you can achieve a secure mounting by using as many as possible of the seven eyelets around the edge of the Hortihood 90º. And unlike a traditional greenhouse there’s no glass. 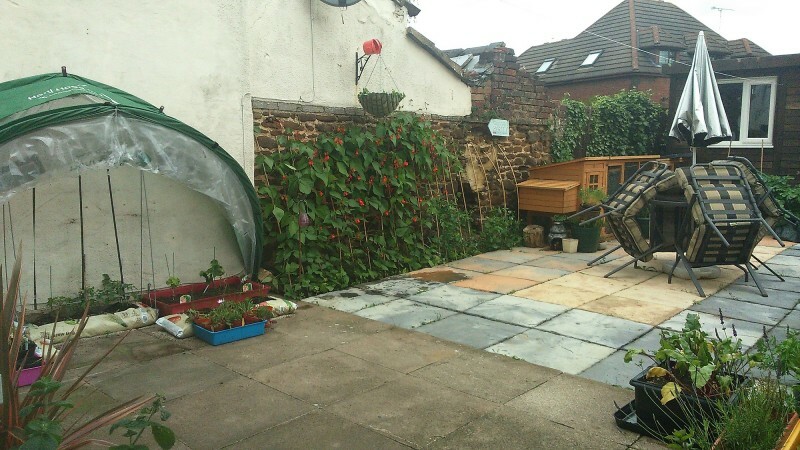 The Horti Hood 90 folding greenhouse shrugs off footballs (and most other missiles) and if a child should plough into it at full speed, they’ll just bounce off! 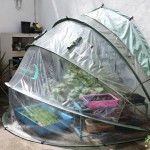 Much more entertaining and considerably safer than a conventional glass greenhouse. 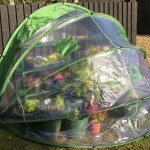 Hortihoods are made of a UV stabilised PVC which is actually a 100% recyclable material. In years gone by PVC had a bad reputation, but the benefits of this material are now better understood. Let’s look at the facts… PVC is a synthetic material derived from oil and salt and is one of the most scientifically investigated substances on the planet. Investigations have consistently found that far from being a problem material, science indicates that it is not very different from other materials and indeed has some interesting natural advantages. PVC is a material with a lower carbon footprint and minimal environmental load in terms of CO2 emission, compared with metal or glass products of the same application. PVC uses less natural resources to produce. 57% of PVC is made out of chlorine, which is derived from common salt that is abundant on earth. Therefore PVC contributes significantly to saving oil or gas, which are non renewable resources, in comparison to other plastics whose composition depends entirely on oil. Plastics are often perceived as symbols of throwaway or single use. However, they are durable materials that do not rust or corrode. PVC is an exceptionally durable plastic, used for instance in water supply and sewage pipes, which can last for over 50 years. As shown in a number of our images, you can use proprietary staging or shelving, readily available at most good garden centres to take advantage of the product’s height particularly at the rear against a wall or fence – however please note that the product is not supplied with staging. 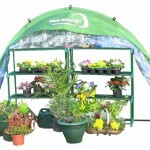 Horti Hood & HortiHood are registered trade marks. 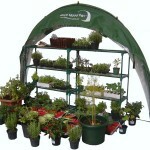 The HortiHood 90 ranges are protected by European Community design registration & US Design Patents. 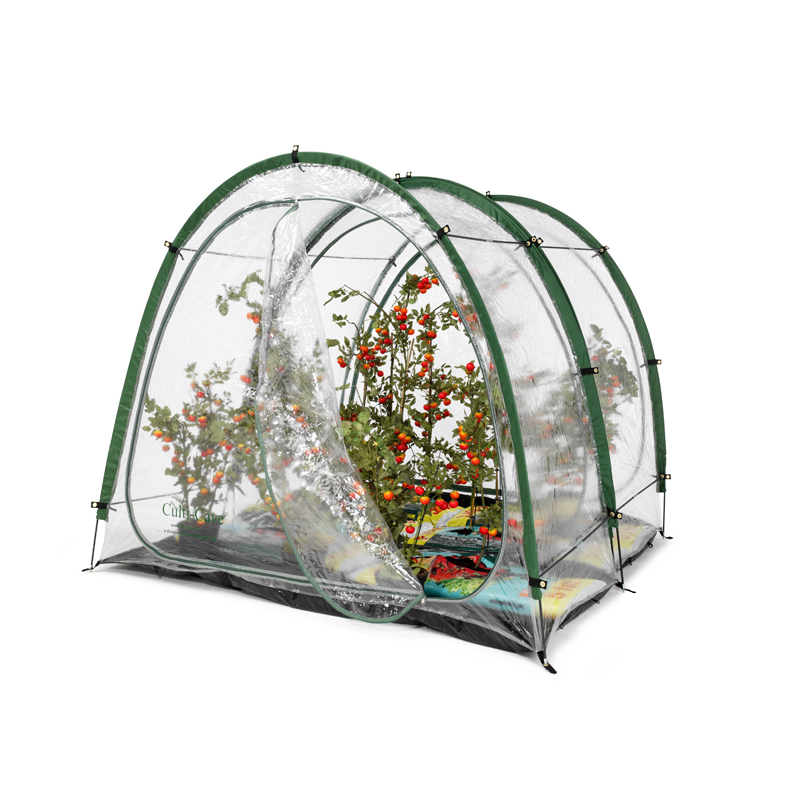 Click on the video below to see more information on the HortiHood 90 folding greenhouse. Great product, grew some lovely courgettes and tomatoes this summer! Great product that was pretty easy to set up. Good for the winter months to stop your plants dying. Fit perfectly on my wall, would recommend. 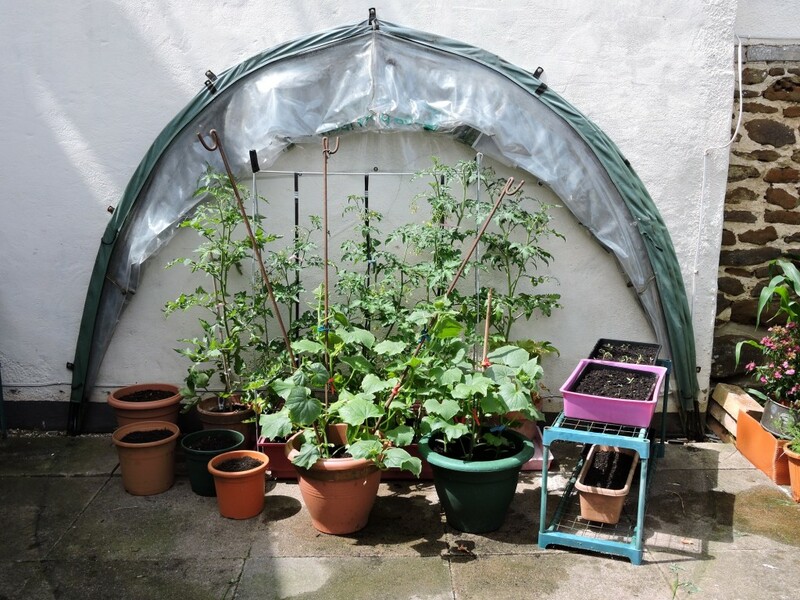 The Horti Hood has really worked out as an ideal mini greenhouse for me. Two seconds to lift it up out the way and I can get to everything. I’ve grown some really nice tomatoes this year. 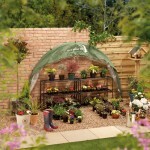 It’s also perfect for putting some of my more vulnerable plants away when it gets cold. It was fairly easy to set up but I would recommend you get someone to give a hand as it’s quite a big old beast.